Many positive developments are expected in the peninsula as it integrates to Russian systems, although some serious problems remain as well. 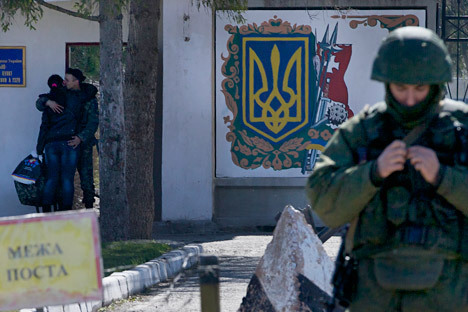 There are a large number of pieces of Ukrainian military hardware left in Crimea. These include, according to various estimates, at least 30 warships and auxiliary vessels, some 150 APCs and 50 tanks, 60 MiG-29 fighters and L-39 trainer aircraft, about 20 helicopters, some 60 S-300 surface-to-air missile systems, and about 40 Buk-M1 and Tor medium- and short-range surface-to-air missile systems as well as coastal defense systems… It is hard to say whether all this "legacy" will be of use to the Russian Armed Forces. A number of ships are moored at the Yuzhnaya naval base on Lake Donuzlav near Yevpatoria, meanwhile. These include the large amphibious ship Konstantin Olshansky, the medium landing ship Kirovograd, the corvette Vinnitsa, the transport ship Gorlovka, the minesweepers Chernigov and Cherkassy, the harbour minesweeper Genichensk, and a dozen more vessels. They cannot reach open sea since their path is obstructed by two old ships that have been deliberately sunk to block passage. These can of course be lifted to the surface, but that would require considerable time and money. It also raises the question of who will pay for it. If Moscow decides to return the blocked ships to Kyiv, then the associated costs would have to be borne by the Ukrainian Navy, while if the vessels remain in Crimea, then the Russian Black Sea Fleet will have to foot the bill.